Does your little one like clownin' around? Of course she does, what kiddy doesn't?! And since the best way to have a silly, good time is while dressed up in a fun clown costume, your little gal will have a very funny Halloween while she's sporting this Lolli the Clown Costume! If you've never heard of Lolli the Clown, don't worry, she's a bit of a newcomer to the clown community. But don't let that fool you: Lolli is no amateur! She always puts on different acts, and performs a wide variety of tricks and jokes, each one different from the last. 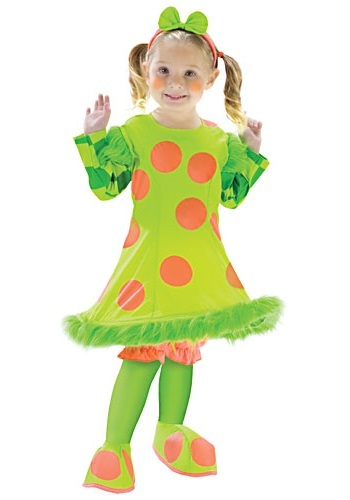 The only thing that's the same between one Lolli performance and another is this cute, green, polka dotted dress, which has a big hoop built into the bottom of the skirt, so it keeps its round shape. The crafty joker also likes wearing matching green leggings, and big polka dot clown shoes. The best part about your little gal dressing up like Lolli is that she can wear any kind of silly makeup and any style of clown wig she wants, to create her own unique look to wear while clowning around! You'll find everything your little one needs to make her own adorable Lolli the Clown look, including a polka dot dress and set of matching shoe covers, a pair of green leggings and orange bloomers to wear under it, and a bow shaped headband. All she'll need is some clown make up (with a little parental help, of course) and a wig to have a hilarious trick-or-treat adventure!